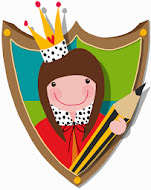 Queen Kwak: Royal Feasts: Bento lunch epiphany. Last week I had an epiphany, a proper angel chorusing 'hallelujah', life altering, seeing the light moment... I discovered bento lunches, all thanks to this blog: www.meetthedubiens.com. This lady is a genius, seriously, she is AMAZING and I knew from there on, that fine dining at Kwak palace will forever be changed... They will be funky as, fact. It took every single possible ounce of my will power not to immediately buy every single bento creating gadget available, I was a very strong lady that day. The following pictures depict our week of bento lunches. I am not sure if bento lunch is really the correct term, as I imagine that is more appropriate to the lunch box food, but as I do not know a proper term for this, that is what I shall call it. The pictures show what I served the little lady, aged 3. The little chap had similar but chopped up and pieced back together, not quite so pretty on the photo front I'm afraid. Photo above. A cheese and ham sandwich with tomato portholes, ham sail and cheese flag. 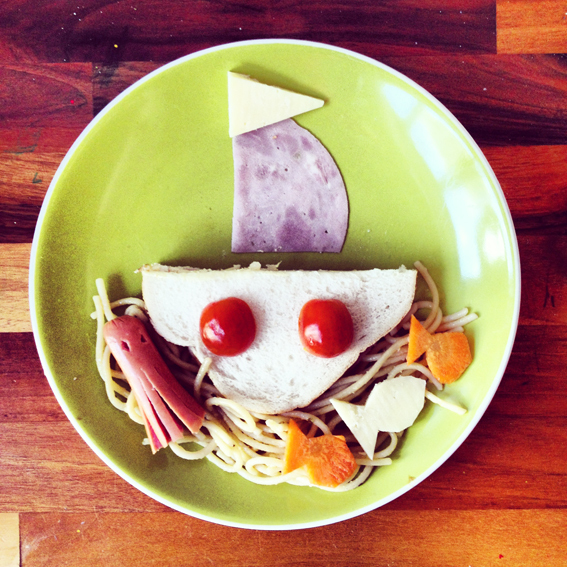 spinach spaghetti waves with carrot and cheese fish and frankfurter octopus. Covers most food groups I feel. Poor effort I know. 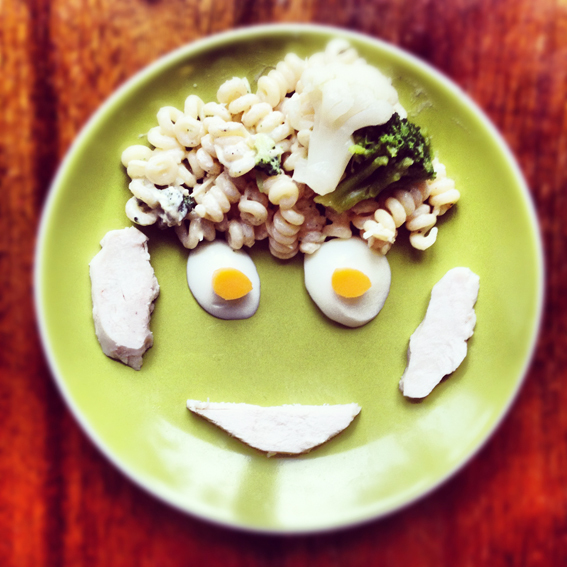 Cream cheese and chopped spinach pasta hair, broccoli and cauliflower hair bow, egg eyes and chicken ears and mouth. Whilst I am normally quite modest, I do feel this was my piece de resistance. 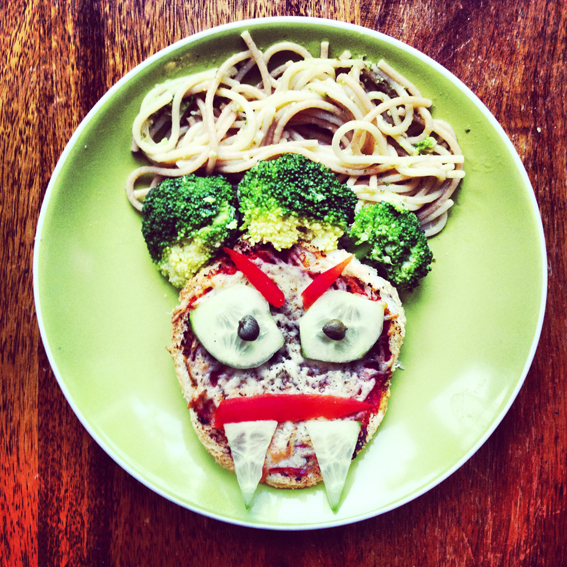 Tomato and ham homemade pizza with cucumber fangs and eyes, caper eyeballs, red pepper mouth and eyebrows, olive oil and broccoli spaghetti hair with broccoli snakes. We were getting into the halloween spirit, she even wore a witches costume to eat it. A bit of a failure, you can't win them all, but seriously have you ever tried to carve beetles out of frankfurters? its hard. 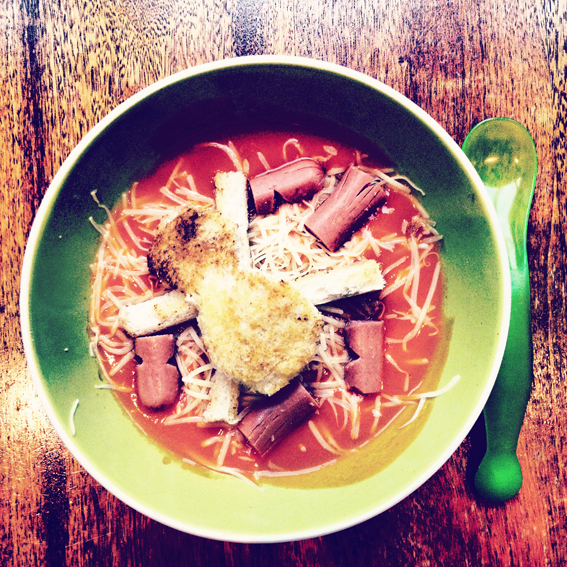 Tomato soup, grated cheese, toast spider and frankfurter beetles that look nothing like beetles. I rushed. 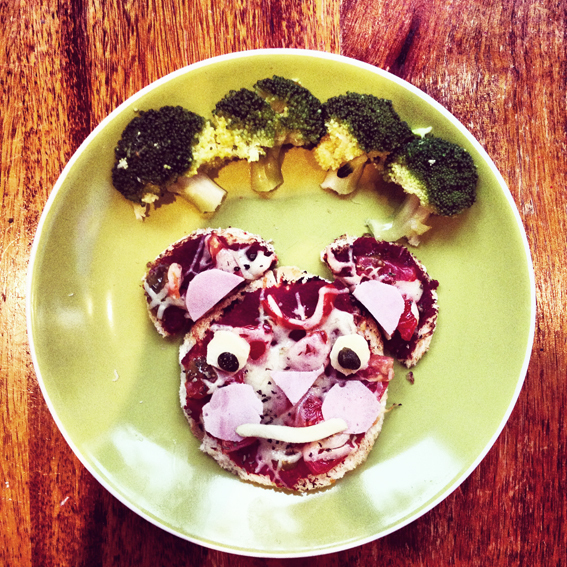 Tomato and cheese home made pizza bear head with ham, cheese and caper features, cabbage smile and broccoli trees. After serving the bear masterpiece, yes I was quite proud of that one, my little lady, aged three, sat me down, patted me on the knee and said 'mummy, please stop making scary food, please make normal food'. A. bullet. in. my heart. So that is the end of that. Sob. But it won't be, I will just let my bento making dream lay low for a week or two, then it will be back, super friendly scenes a plenty, she will see. After the initial devastation of 'our chat', I did realise she had endured 5 days of it, 5 days of me sat right next to her applauding myself whilst she ate. Also I could only come up with bread based ideas, and neither of my babies particularly like bread (nightmare) and I very, very rarely ever gave her pizza before, and frankfurters never, so I can see her point. Slightly. but like I said, I am not crushed, my bento dreams will return.